Who could resist these cheerful looking plants? Aside from their appealing nature and unusual appearance, they also have some of the coolest common names. They are mostly known as Jelly Bean Plants for obvious reasons. But they are also called these other fun names: Pork and Beans and Christmas Cheer. Wondering where Christmas Cheer came from? Take a look at the picture below and you will wonder no more. These plants somehow magically transform themselves from green to red when left under intense heat or full sun. This usually happens in the summer months when the temperature is at its highest and the sun is blazing. The plant turns red when it is under stress. If you want to see a variation in color aside from green on your Sedum Rubrotinctum plant, try increasing the amount and intensity of light it receives. Native to Mexico, Sedum Rubrotinctums have little bean-shaped succulent leaves that are tightly clustered together on a thin stem. These leaves can be anywhere from dark green to red depending on sun exposure. Their stems tend to sprawl and spread out as they grow, making them ideal for hanging baskets. You can also use them as ground cover in areas that receive mild frost. They are hardiest in USDA hardiness zones 9-11. I am lucky to live in sunny California where I can grow my Jelly Bean Plants outdoors all year long. They survive the heatwaves in the summer and the freezing rains in winter time. I can honestly say these are one of my all-time favorite succulent plant…but I do say that about most of my plants. Sedum Rubrotinctum needs plenty of bright sunlight. They do well in areas that receive partial shade to full sun. Are They Indoor or Outdoor Plants? 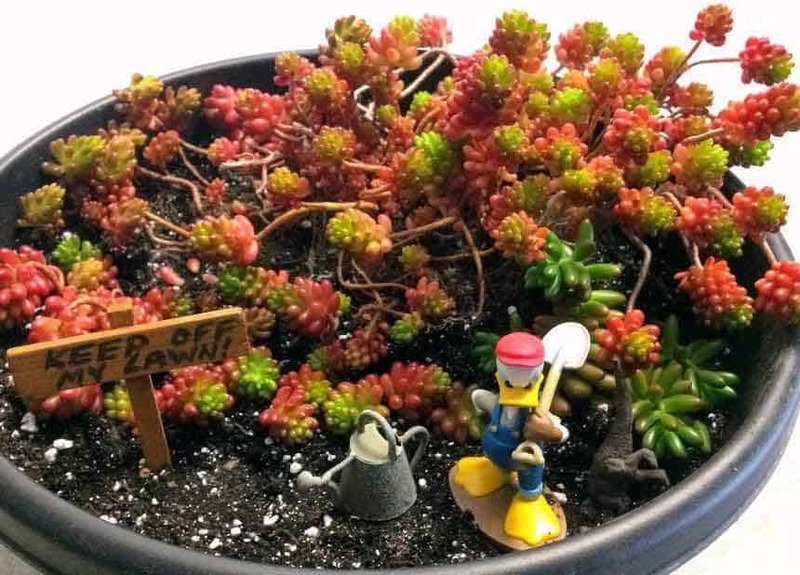 Sedum Rubrotinctums can be grown both indoors and outdoors. Whether indoors or outdoors, providing the right potting mix (a well draining one) along with proper lighting will give them the best chance at survival. If kept indoors, provide as much light as possible. Typically speaking, they need approximately 5-6 hours of light per day to thrive. East, south or west facing windows will all work. You may need to move the plant around until you find the best spot for it. If you live in an area that does not receive adequate light indoors or if you have poor lighting, you may notice your plant stretching out or elongating. This is called etiolation, wherein the plant does not receive adequate light for prolonged periods of time and begins to literally stretch out seeking for more light. This process weakens the plant and does not promote healthy growth. If you have poor lighting you can consider using a growlight. Growlights are a good investment to have especially if you you have long, dark winters or if your area does not receive enough sunlight. Here are some of my growlight recommendations. If kept outdoors, place in a bright sunny location. Before moving the plant outdoors or increasing the amount of sunlight it receives, it is better to acclimate the plant to prevent sunburn. Slowly increase the amount of light the plant receives to get it acclimated to the more intense light. This will help prevent sunburn or sun damage. 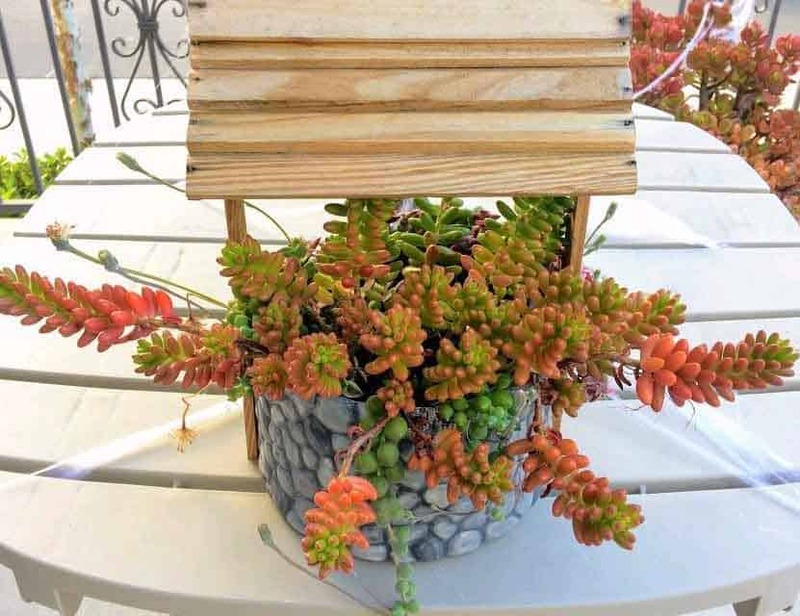 Sedum Rubrotinctum can handle full sun or intense heat once acclimated but do keep in mind that even when the plant is already acclimated to the sun, it can still get sunburned during a particularly intense heatwave. You can move the plant to a shadier location during a heatwave to prevent sun damage or you can provide sun protection or shade. Sunshades are a real lifesaver for my plants during the intense summer heat here in Northern California where the sun can really scorch the plants if left unprotected. Here are some of my recommendations for sunshades and sun protection. While Sedum Rubrotinctums can tolerate mild frost and even freezing temperatures, they are not meant to withstand extreme winter conditions and below freezing temperatures for prolonged periods of time. As I have mentioned, I keep my plants outdoors and they do fine even in mild frost and freezing rain, but we do get plenty of sunshine during the day, which helps save my plants. If you live in a climate with harsh winters, it is best to keep them in containers so you can bring them indoors if frost is expected or before winter sets in. If planted in ground or if you can’t move the plant indoors, provide protection from freezing temperatures using frost cloths and greenhouses. These frost cloths can save your plants and protect them from the long, harsh winter months. Here are some of my recommendations for frost protection. For more information regarding this topic, do visit my post on “Optimal Temperatures for Succulents to Thrive”. Sedum Rubrotinctums are no different from other succulent plants when it comes to soil requirements. They need a well draining soil. Wet soil for long periods of time will promote root rot. What has worked well for my plants is a combination of cactus potting mix and perlite for more drainage. I like this combination mainly because it is easy to do, convenient, and it works. I do not use exact measurements but eyeball it to about 2:1 solution of cactus mix and perlite. Others recommend using a sandy soil. This can be achieved by mixing cactus mix or potting soil with coarse sand (about 2:1 ratio). I get most of my materials from a local hardware store. To find some of these materials online click on my resource page for helpful recommendations. To find out more about soil for succulents, I have written a very informative article about the best soil and fertilizers for succulents. 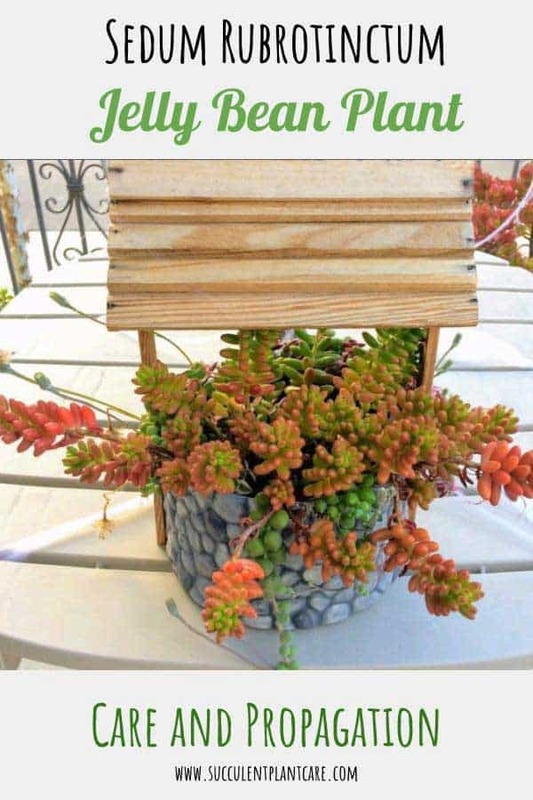 You can read more about it on “Best Soil and Fertilizers for Succulents”. How and when to water greatly depends on the climate you live in. There really isn’t a set schedule or formula on when to water succulents. I live in a very dry climate so my watering schedule is dictated by the dry conditions of my environment. In the summer months, I water my Jelly Beans every 7-10 days, sometimes more during a heatwave, giving the plant a good drink. I cut back on watering to about 10-14 days when the weather cools down in the spring and fall. If you live in a humid location, you won’t need to water as much. During winter season, I mostly rely on rainwater and hold back on watering altogether because this is when we get a lot of rain in my area. But if we don’t get any rain at all during winter then I water at least once a month or every 2-3 weeks, depending on how dry the soil gets. One good way to tell whether it’s time to water is to check the moisture of the soil. The top inch of the soil needs to feel dry before you can water again. If you are unsure how much and how often to water in the beginning, it’s always better to underwater and increase watering as needed. Pay attention to how your plant looks and you can adjust watering accordingly. The best way to tell whether your Jelly Beans are over or underwatered is by paying attention to how the leaves look. The easiest way to tell if your plant is underwatered is when the leaves start shriveling and lose their plumpness. When this happens, it is usually a sign that the plant is running low on its water storage and it is time to water. If this is the case, give the plant a good drink and it should perk up within a day or so. It is easier to ‘fix’ an underwatered plant than an overwatered one. If the plant starts looking unhealthy, becomes soft and mushy, drops leaves at the slightest touch, these are telltale signs that you are overwatering your Jelly Bean Plant. These plants have storage capacities in their stems and leaves and if you overwater them, they swell up and can literally burst from too much water. If this is the case with your plant, don’t panic. The first thing you need to do is to stop watering your plant. Give it a chance to dry out and the plant will usually bounce back. If the soil is not drying out fast enough and stays wet for long periods of time, it is a good idea to repot the plant in a well draining potting mix. If the plant does not recover from overwatering and starts to rot, you can still save the plant by removing it from the wet soil, remove any dead or rotten parts, save any green parts or viable parts and let them dry out for a few days then propagate and repot in a well draining potting mix. 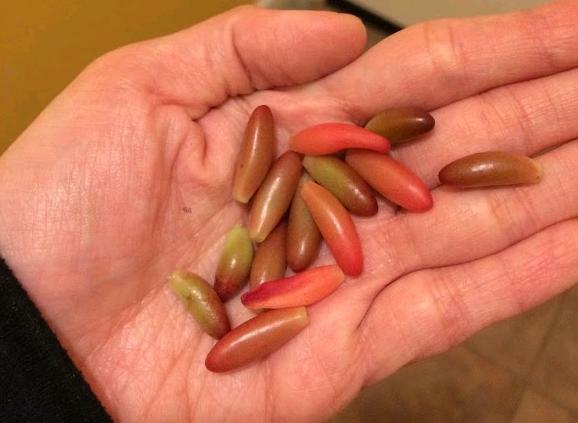 Why Do Jelly Bean Plants Drop Their Leaves? Leaves from Jelly Bean Plants tend to be fragile and can fall off easily during transport or when repotting. But if you notice an alarming amount of leaves falling off, it is usually a sign that the plant is under stress. The most common reason for Jelly Beans to drop their leaves is watering issues. An underwatered plant will shed their leaves as a defense mechanism to conserve water storage. Usually when this happens you will also notice shriveled and dried up leaves on the bottom. This means you are not watering your plant enough and it is time to water the plant. Be careful not to overcompensate by overwatering. Just give the plant a good drink of water and increase frequency of watering to suit your plant’s needs. An overwatered plant can also shed leaves, but the plant will look different. Instead of dried, shriveled leaves the leaves will appear lighter in color or more translucent. The leaves will also feel soft and mushy. When this happens, let the plant dry out completely to help it recover. Decrease frequency of watering and only water when the top inch of the soil is dry. If needed, switch to a well draining potting mix to ensure that the plant is drying fast enough. If you need further help with watering techniques, consider using tools like hygrometers or moisture meters to check for moisture in the soil and air. These tools are pretty affordable and can come in handy especially if you are unsure of when to water your plant next. Do check out these tools on my resource page if you need help in gauging your watering needs. 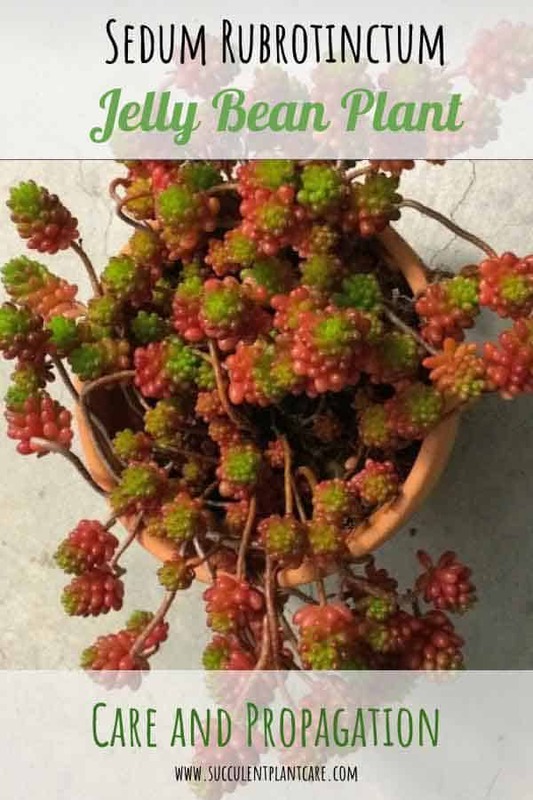 For more details on problems with Sedum Rubrotinctum, visit my other post on “Why Are The Leaves on My Jelly Bean Plant Falling Off?” for a detailed guide on how to solve these problems. Sedum Rubrotinctums can be propagated from leaf or stem cuttings. Both are easy and success rate is high. My preferred route is stem cutting because it is faster. Leaf propagation is just as easy with these plants but you have to wait for the baby plant to grow and develop into a mature plant, which naturally takes longer. Take a few leaves. When doing so make sure to get the entire leaf to ensure survival. Put the leaves in a dry area away from direct sunlight and let them dry for a day or so. Or Take a few stem cuttings. You can choose stems that have become leggy and long. 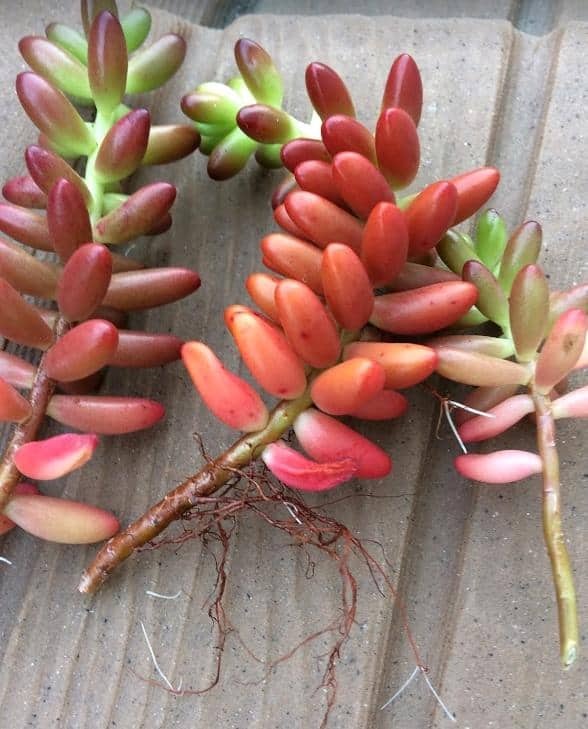 Unlike other succulents with thick stems, Jelly Bean stems are thin so you do not have to wait too long for the stems to dry. Let it sit for a couple of hours to about a day or two to dry. Prepare a suitable well-draining potting mix. Stick the stem cuttings in soil. You can either stick the leaves in soil or lay them flat on soil. Wait for the cuttings to root. This usually takes anywhere from 2 weeks to a month or so. When rooted, stem cuttings are usually good to go. Leaf cuttings can be tricky. Some leaves no matter what you do, will not survive. It is a good idea to start with a few leaves when propagating because you will naturally lose one or two along the process. Keep away from direct sunlight to prevent sunburn while propagating and rooting the cuttings. Mist or water every few days or when the soil feels dry. Once rooted and more established, stop misting and switch to watering the plant. You can decrease the frequency of watering to about once a week or less when the plant matures. Increase sunlight as the plant matures. There you have it. With just a few steps and some patience, you’ll have yourself a few new plants. Sedum Rubrotinctums produce bright yellow flowers from mid-spring to summer. These bright yellow flowers look so cheery they will surely brighten your day. Keep in mind that not all plants will bloom. A lot of it depends on environmental factors beyond our control. Make sure the plant is mature enough to bloom. When a plant blooms it means it is ready to reproduce. If the plant is too young, it is simply not ready to reproduce and therefore will not bloom. Give the plant some time, usually if the plant is over 3 years old and beyond, it is ready to bloom. Make sure the plants are receiving adequate sunlight throughout the year and are kept in a bright location, even during colder winter months. To encourage flowering, provide proper temperatures. They need a distinct difference in night and day temperatures as well as summer and winter months. Succulents favor cooler outdoor nighttime temperatures of 50-55⁰F (10-13⁰C) or indoor night temperatures of at least 60-65⁰F(15-18⁰C). Especially when kept in a controlled environment, succulents prefer a marked difference between their night and day temperatures to mimic their natural habitat, with the cool night temperatures having an integral part in the plant’s growth cycle. Overwintering is also important if you want to see your succulents bloom. This can be achieved by keeping them cool and relatively dry in the winter months, especially desert cacti. Keep them cool during winter months with temperatures just above freezing, between 35-44⁰F (1.5-7⁰C). If kept indoors during winter, have them in a non-heated room if possible or keep the temperatures low to provide them the cold winter period that they need. While fertilizing is not necessary, giving your plants the nutrients they need will help ensure proper growth and encourage blooms. It takes a lot of energy for plants to produce flowers, and feeding them extra nutrients will help supplement their needs during flowering season. The most common recommendation is to fertilize during the active growing season, or during spring and summer months. Fertilizers are better applied at a quarter or half strength, about every two weeks. Refrain from fertilizing towards the end of fall season and during winter months. A balanced blend of fertilizer diluted to half strength is suitable and commonly used. Fertilizer blends specially formulated for cacti and succulents are also suitable. There is inconclusive data about whether or not Sedum Rubrotinctum is toxic to pets. Some sites list the plant as potentially dangerous or mildly toxic to cats and pets while others list it as safe. It is better to proceed with caution if you have pets around due to conflicting information regarding its safety. Visit the ASPCA website for more information on toxic plants. If you suspect poisoning, contact your local veterinarian immediately or the ASPCA Animal Poison Control Center at 888-426-4435. 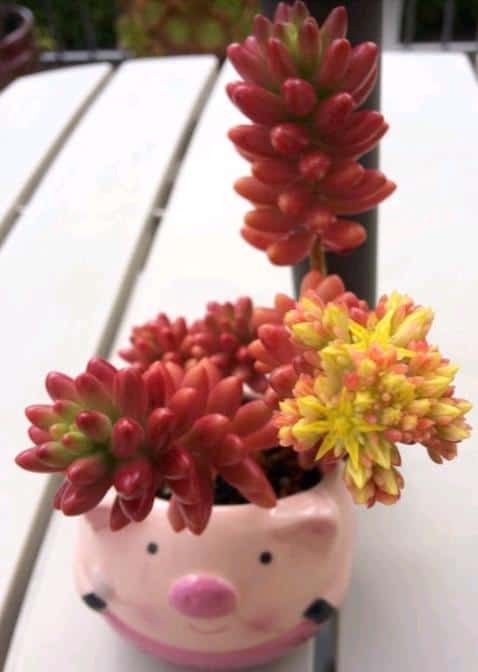 Sedum Rubrotinctum ‘Jelly Bean Plants’ are one of the easiest succulents to grow and propagate. I have them growing in different containers around my house. I love how cheerful they look and how easy they are overall. Consider growing one of these plants and you would soon reap the benefits. I hope you enjoyed this article and found it useful. 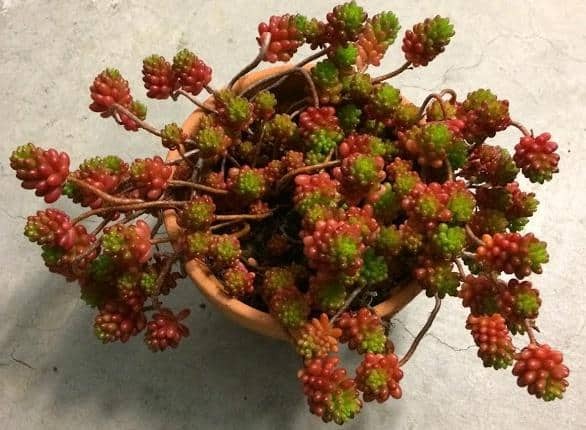 To read more about Sedum Rubrotinctum- Jelly Bean Plant, please visit my other post “Jelly Bean Plant-Sedum Rubrotinctum” where you will find more information and pictures. Where can you find Sedum Rubrotinctum ‘Jelly Bean Plant’? Check out my resource page for recommendations on where to purchase these and other succulent plants online. Pin this now to save for later or share with others!